JAMES RIVER, NS (June 15, 2013) – Rarely do you see a race when the smile on the face of the second-place finisher is just as big as that of the winner, but that was case Saturday night at Riverside International Speedway after Donald Chisholm (Antigonish) claimed the checkers for the Ron MacGillivray Chev Buick GMC 150 in the Parts for Trucks Pro Stock Tour. It was John Flemming (Halifax) in the runner-up spot, but the finish order wasn’t decided until lap 148 – after an amazing 14 lead changes in the last 60 laps between the two that saw them running side-by-side lap after lap, after lap after lap. Both drivers were exuberant in post-race interviews exclaiming how much fun it was to race hard and clean. Darren MacKinnon (Charlottetown, PE) finished third, followed by Jonathan Hicken (Brudenell, PE) in fourth, and Brad Eddy (Lower Sackville) in fifth. Besides Chisholm and Flemming, the only other lap leader was George Koszkulics (New Glasgow) who started from the point and led the first 54 circuits before Chisholm overtook him and led the next 34 laps; Flemming passed Chisholm to lead for the first time on lap 90 – and then the fun began with side-by-side and fender-to-fender racing – the two barely more than a car length apart for the remainder of the race. 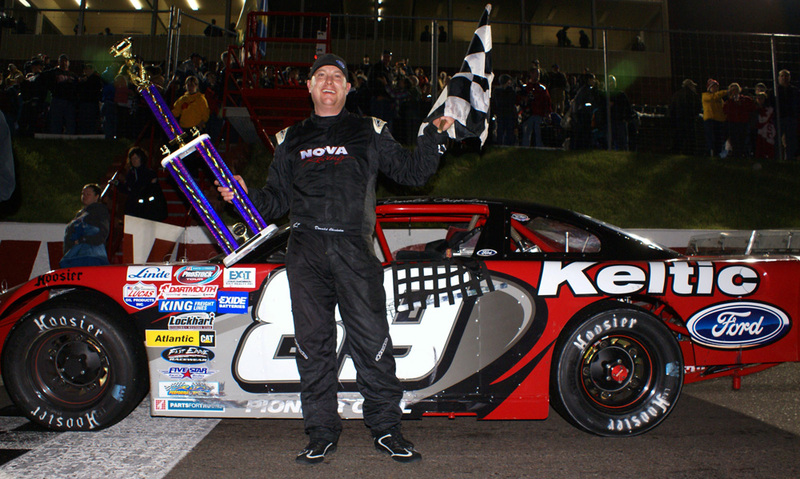 Flemming’s runner-up spot was enough to overtake the series point lead after two of 12 events; he holds a 22-point advantage over previous point leader Shawn Turple who finished the race 12th after a late-race tussle with Greg Proude (Charlottetown); Turple ended up sideways against the inside concrete retaining wall on the front stretch but was able to finish the race. Chisholm’s win moved him to the third spot in the standings, just six markers behind Turple. Chisholm collected the Linde Most Laps Led Award after being on the point for 73 of 150 laps. Five cautions slowed the event’s blistering pace; it took just under 1 1/2 hours to complete. Twenty-eight cars started the race (complete results below). Pro stock heat race winners included Koszkulics, Greg Proud (Springvale, PE), and Chisholm. Time trials and the Dash race were eliminated from the show after a 1 1/2 hour rain delay late in the afternoon. Besides pro stocks, the thousands of fans on hand saw Ross Lewis win the Highland Home Building Centre 50 for the Napa Sportsman Series. Phil Barkhouse Jr. was second and JJ Cusack third. Harry Ross White and Corey Breen round out the top five, respectively. Sportsman heat race winners were Barkhouse, Brad DeCoste, and Lewis. See complete sportsman feature results here. Riverside International Speedway management now turn their focus to the 2013 edition of the IWK 250 presented by Steve Lewis Auto Body, featuring 2012 NASCAR Sprint Cup Series champion Brad Keselowksi. Advance ticket sales have been brisk and campsites are nearly sold out. The weekend gets underway July 19 with the Highland Home Building Centre 100 for the Napa Sportsman Series, along with the Maritime Legends Challenge for the Maritime League of Legends. The IWK 250 is set for July 20. The Parts for Trucks Pro Stock Tour resumes action next Saturday (June 22) at Scotia Speedworld for the Lockhart Truck 150. The Parts for Trucks Pro Stock Tour (PST) is considered the highest level of stock car racing in Canada. The Tour is recognized in the industry as one of the healthiest stock car racing series in North America. PST visits five tracks throughout the Maritimes during its May through September season. The Parts for Trucks Pro Stock Tour is owned and operated by Maritime Pro Stock Tour Limited. For more information, call our administration office at 902.481.2531 or click www.maritimeprostocktour.com . You can also follow us on Twitter at www.twitter.com/prostocktour and like us on Facebook at www.facebook.com/prostocktour.